Segregation phenomena are ubiquitous in metallurgical alloys. Examples are macroscopic and mesoscopic compositional fluctuations inherited from solidification, constitutional segregation across dendrites, and solute decoration of lattice defects such as grain boundaries and dislocations. Specifically the latter type of segregation can be well characterized by atom probe tomography [R1-R7]. In the approach referred to as 'segregation engineering' such phenomena are not treated as undesired effects which have to be accepted as by-products of metallurgical constitution and thermomechanical processing but instead can be turned into alloy design tools [R8-R10]. Here we address equilibrium segregation to lattice defects, primarily to grain boundaries. The thermodynamic driving force for this process follows the Gibbs’ adsorption isotherm [R11-R13]. Grain boundary segregation engineering aims at manipulating the interface structure, energy, composition and properties to enable beneficial material microstructures behavior. Depending on the targeted microstructural effect suited matrix-solute combinations for grain boundary segregation engineering in metallic alloys can be identified considering the segregation coefficient of the decorating element; the influence of the solute on grain boundary cohesion, energy and mobility; the solutes’ mobility and the formation energies of other phases competing with segregation [R8-R10]. Unlike bulk phases, grain boundaries are planar defects which are characterized by their crystallographic misorientation and the alignment of the interface plane, i.e. grain boundaries are a high dimensional class of defects. Grain boundary features are often attributed to certain classes of interfaces [R14]. These are mainly random, i.e. less ordered high angle grain boundaries, low angle grain boundaries which consist of dislocation arrays and ordered high angle grain boundaries with a high frequency of coincidence atoms. The latter types of grain boundaries can be described in terms of the coincidence site lattice CSL, such as the Σ3 first order twins. 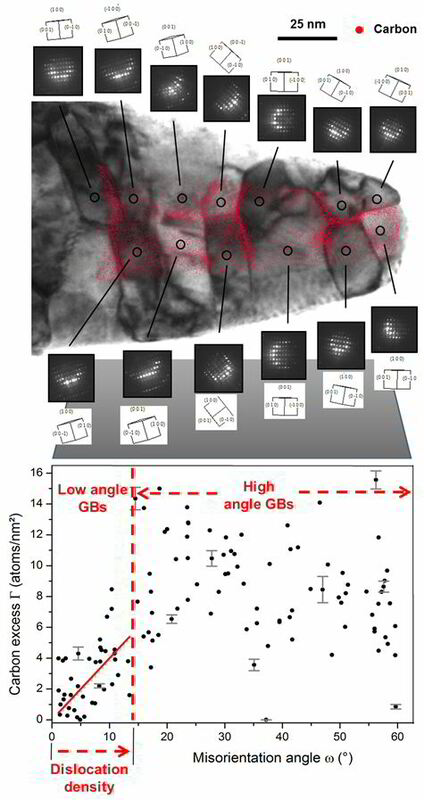 Regarding grain boundary segregation, it is observed that often the grain boundary plane inclination plays an equally important role for segregation as the actual crystallographic misorientation across the interface [R3]. For example on fully coherent twin grain boundaries, where the boundary plane aligns with the twinning plane, segregation is typically negligible. However, for the same grain boundary, incoherent interface portions are prone to solid decoration. Also, grain boundary segregation was observed to change drastically already when deviating by a few degrees from such symmetry configurations [R3]. This means that in the field of grain boundary segregation engineering both, the misorientation and the grain boundary plane have to be taken into consideration. Grain boundary segregation engineering can be applied in two directions. In the first (indirect) approach segregation to grain boundaries is used to manipulate the resulting microstructures with the aim to beneficially influence the resulting mechanical behavior through the underlying microstructure-property relationships. Altering the thermodynamic and kinetic properties of interfaces in that context provides access to wide range of microstructure designed pathways. An example is the stabilization of small grain sizes by solid decoration of grain boundaries. This reduces the grain boundary energy and hence the capillary driving forces as well as the grain boundary mobility. The two effects lower the rate of grain growth, where it is interesting to note that the reduction in driving force has a linear effect on grain growth kinetics while mobility changes can have exponential influence [R15-R18]. Fig. RA 1 shows an example where carbon decoration of grain boundaries has been used to stabilize the grain structure in nanocrystalline steel [R3]. This was realized by reducing the grain boundary energy and the mobility of the interfaces. Influencing these two parameters is paramount in the design of nanocrystalline metallic alloys since grain growth and discontinuous grain coarsening are main courses for insufficient mechanical properties, specifically low ductility, of such alloys. 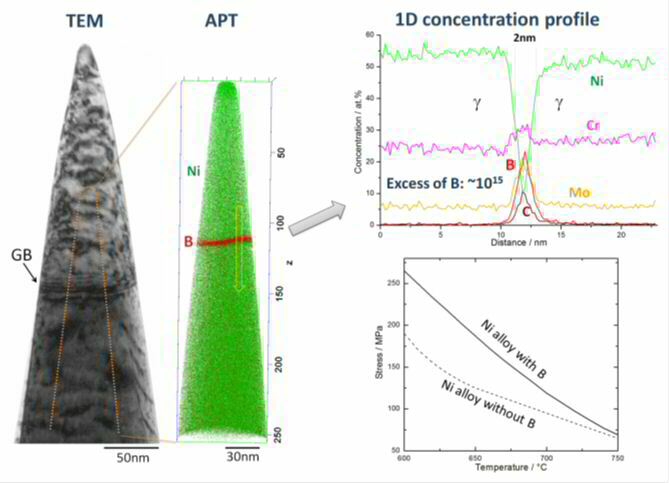 The corresponding analysis was conducted by applying a combination of transmission electron microscopy (TEM) and atom probe tomography (APT) to the same sample position [R3]. The approach is referred to as correlative microscopy [R1-R3,R19]. A second, more direct way to modify the materials’ properties via grain boundary segregation engineering lies in using decorating elements which improve interface cohesion [R20]. Fig. RA2 shows an example of alloy 617 (a NiCoCrMo based creep resistant high temperature alloy) where the segregation of B to high angle grain boundaries leads to enhanced interface cohesion and promotes the formation of precipitates [R20]. Both effects increase the creep resistance of the material. The mechanism was revealed by using correlative TEM and APT. These two examples demonstrate that the recent progress in conducting correlative atom probe tomography and electron microscopy enable us to study details associated with the manipulation of grain boundaries by solute segregation. Correlative TEM/APT observations also indicate that the classical picture of interface decoration by solid solution represents only one phenomenon out of a wider range of possible interface manipulation mechanisms. These can include classical equilibrium and non-equilibrium solute segregation; monolayer occupation; interface wetting; interface stabilized phases (viz. complexions); discontinuous precipitation; equilibrium bulk phase formation or phase reversion. All these types of segregation-induced grain boundary phenomena can be used for improving the mechanical response of alloys. 1 B.W. Krakauer, D. N. Seidman, Acta Mater. 46, 6145 (1998). 2 D. N. Seidman, Annu. Rev. Mater. Res. 37, 127 (2007). 3 M. Herbig, D. Raabe, Y.J. Li, P.-P. Choi, S. Zaefferer, S. Goto, Phys Rev Lett, 112 126103 (2014). 4 P.J. Felfer, T. Alam, S.P. Ringer, J.M. Cairney, Microsc Res Techniq 75, 484 (2012). 5 B.W. Krakauer, J.G. Hu, S.M. Kuo, R.L. Mallick, A. Seki, D.N. Seidman, J.P. Baker, R.J. Loyd, Rev Sci Instrum 61, 3390 (1990). 6 D. Raabe, P.-P. Choi, Y.J. Li, A. Kostka, X. Sauvage, F. Lecouturier, K. Hono, R. Kirchheim, R. Pippan, D. Embury, MRS Bulletin 35, 982 (2010). 7 Li, Y.J., Choi, P.P., Borchers, C., Westerkamp, S., Goto, S., Raabe, D., Kirchheim, R., Acta Mater 59 (2011) 3965–3977. 8 D. Raabe, M. Herbig, S. Sandlöbes, Y. Li, D. Tytko, M. Kuzmina, D. Ponge, P.-P. Choi, Curr. Op. Solid State and Mater. Sc. , 18, 253 (2014). 9 M. Kuzmina, D. Ponge, D. Raabe, Acta Mater., 86, 182 (2015). 10 D. Raabe, S. Sandlöbes, J. Millán, D. Ponge, H. Assadi, M. Herbig, P.-P. Choi, Acta Mater. 61, 6132 (2013). 11 J.W. Gibbs, The Collected Works of J. Willard Gibbs Vol. 1, Yale University Press, New Haven, CT, 1948. 12 D. McLean, Grain Boundaries in Metals. Oxford Press, London, 1957. 13 R. Kirchheim, Acta Mater 55, 5129 (2007). 14 A. P. Sutton, R.W. Ballufi, Interfaces in crystalline materials. Oxford University Press, USA, 1997. 15 A.J. Detor, C.A. Schuh, Acta Mater 55, 4221 (2007). 16 J. Weissmüller, W. Krauss, T. Haubold, R. Birringer, H. Gleiter, Nanostruct Mater 1, 439 (1992). 17 Y.Z. Chen, A. Herz, Y.J. Li, C. Borchers, P.-P. Choi, D. Raabe, R. Kirchheim, Acta Mater 61, 3172 (2013). 18 Y.J. Li, D. Raabe, M. Herbig, P.-P. Choi, S. Goto, A. Kostka, H. Yarita, C. Borchers, R. Kirchheim, Phy. Rev. Let. , 113, 106104 (2014). 19 M. Herbig, P. Choi, D. Raabe, Ultramicroscopy 153 (2015) 32. 20 D. Tytko, P.-P. Choi, J. Klöwer, A. Kostka, G. Inden, D. Raabe, Acta Mater 60, 1731 (2012).